There’s a party in the jungle this week as Slots Capital Casino introduces the festive new Party Parrot slot from Rival Gaming. This weekend, if you've made a deposit at Slots Capital previously, you can get 20 free spins on the new game. Until the end of the month, the casino will give you another 50 free spins when you make another deposit. 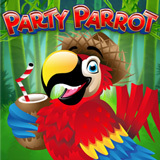 Party Parrot is a colourful slot with an expanding wild and a free spins bonus feature. The free spins symbol can trigger up to 20 free spins. Wilds are sticky during free spins. They trigger another spin and stay on screen during all re-spins. There are lots of exotic birds in this game, including Toucans and Flamingos, but the highest value symbol is a hungry Pelican. Party Parrot has a wide betting range to appeal to all kinds of players. They can bet from one to ten coins per line and coins can be valued at $.01 to $.25 each so they can make a minimum bet of just a penny or wager up to a max bet of $62.50 per spin. Previous deposit required. $180 max cash out. Available March 15 – 18, 2018 only. Min. $25 deposit required. No max cash out. In addition to Party Parrot introductory bonuses, Slots Capital is also tripling deposits for the Irish-themed Shamrock Isle slot game. Bonus valid for Shamrock Isle slot only. Slots Capital, which welcomes players from all over the world, has a huge selection of unique slot games from Rival Gaming. It also offers table games like Blackjack and Roulette.